I was searching for just the right image, and I sure hit pay dirt! 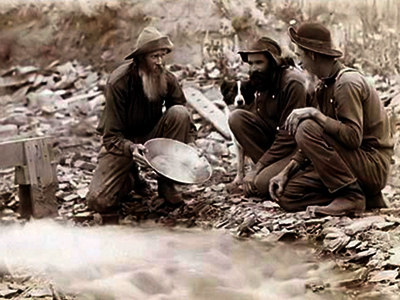 According to this post on language of the gold rush, pay dirt was just that…a term from the gold rush. It was first used in a California newspaper in 1852. It means to discover something of value. And it’s one of the last expressions I’d expect to find in an Elizabeth George novel. I have found several nuggets (pardon the pun) in her books before. Just look at suzerainty, eponymous, and tautology. But pay dirt is such a lowbrow phrase. Or maybe it just seems that way to me. And how fun is this…while researching the phrase, I went around the world (web search wise) only to end up in a Kansas cornfield (in case you didn’t know, I make my home in the sunflower state). There’s a wonderful article on the Smithsonian’s site called, “Pay Dirt: When self-taught archaeologists dug up an 1850s steamboat, they brought to light a slice of American life.” It’s about the finding by a Kansas archeologist of the steamboat Arabia…in a cornfield. I’ve actually visited that Steamboat, which is on view at the eponymous Arabia Steamboat Museum. See what I did there? I hit pay dirt.